Great for homeschool or for extra practice over the summer! 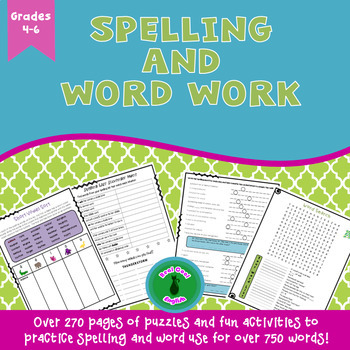 Spelling and word work activities that give many opportunities to practice the spelling and meaning of the words in a variety of ways. Over 270 pages that give ample practice for more than 750 words. 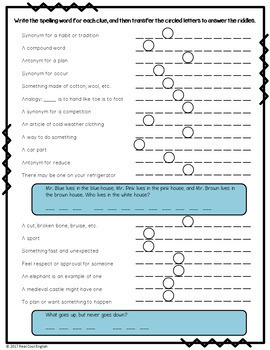 Each unit has a spelling pattern focus with puzzles and activities to practice the words with the given pattern. 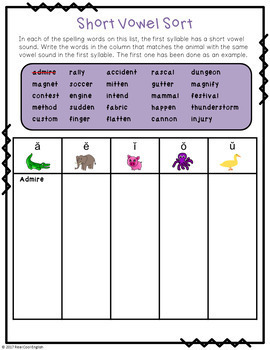 As they go through the activities, students make connections with other language concepts such as alphabetization, synonyms, antonyms, syllables, short/long vowel sounds, analogies, word meaning, compound words, homophones, rhymes, etc. * Spelling list to alphabetize. They can either rewrite the words from their list alphabetically or cut out the words and arrange in order before rewriting them. 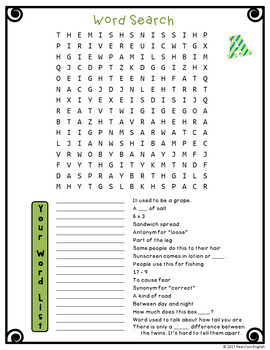 * A word puzzle (there are different types of puzzles for each) such as crossword puzzle, word search, riddle puzzle, cryptogram, etc. (at least one of these) and there are often other puzzles included such as word scramble, cell phone code words, etc. Please go to your My Purchases page. Next to each purchase you'll see a Provide Feedback button. Simply click it and you will be taken to a page where you can give a quick rating and leave a short comment for the product. Each time you give feedback for a paid item, TPT gives you feedback credits that you use to lower the cost of your future purchases. Additionally, your feedback is very important to me as it helps me as I am creating new products. Please also see my other products at Real Cool English!